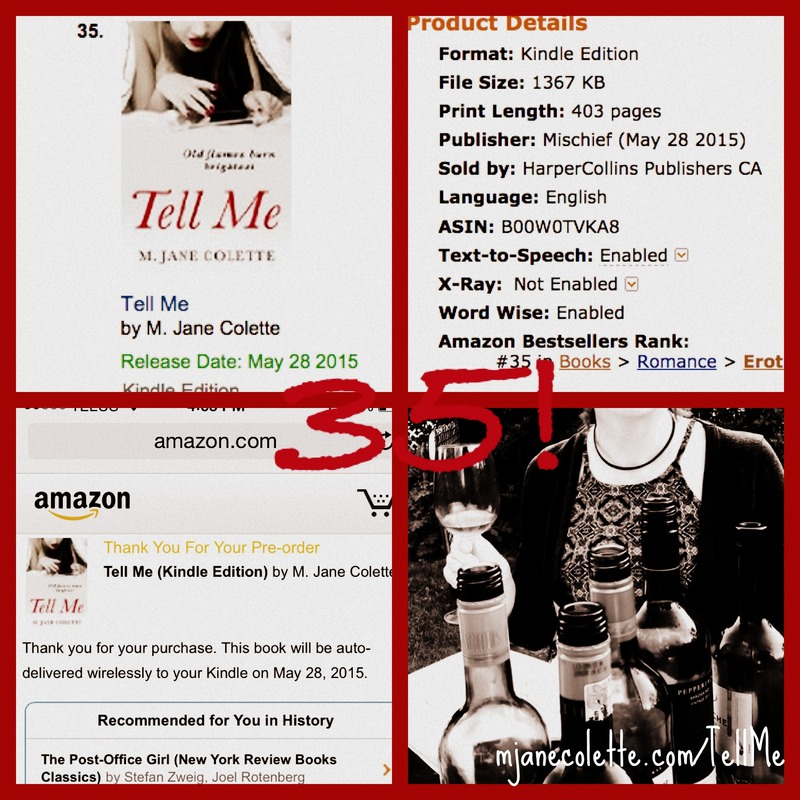 Conference Gossip as Resource + 4 days til you can buy Tell Me! I did something out of character last week. I went to a writers’ conference. I had an incredible time. I took a workshop with Minister Faust (he of the MFGalaxy. Org podcast on the craft and business and writing, and author of The Alchemists of Kush etc. etc. ), and I formed a brief mutual jewelery+boots admiration society with Margaret MacPherson who is about to release her third novel, way to go, beautiful. I met Edmonton poet Alexis Kienlan and kidnapped her for lunch and heard about her almost finished novel (part of which was developed under the guidance of Lawrence Hill–yeah, that Lawrence Hill, how cool is that?). And while I was doing all that, the Mistress of All Things Social at Harper Collins UK/Mischief (Twitter @MissChiefous) informed me Tell Me was now available for presales! Also, in Canada, it’s already the 35th best-selling book in the erotica genre. And not because there are 36 books on the list. 😉 Although—probably because all my friends are being loving, loyal, and supportive and pre-ordering copies. If you buy today, it will auto-deliver to your Kindle on May 28th. Squee, squee, squee. I know a lot of you are waiting for print copies, and I’m waiting to hear about the POD bit of the game plan, but in the mean-time… you can have Tell Me on your phone. In your pocket. Always. Me: OMFG. I can barely function.